A beautiful and relaxing boardwalk isn’t hard to come by when you’re on Long Island – it is home to some of the world’s most beautiful beaches and plenty of parks. From Nassau County to Suffolk County, beaches and parks offering stretches of wooden plank grounds provide a place for the walker, jogger, bicyclist, and romantic couple to family enjoying a stroll. While stepping foot on the boardwalk, feel the natural breeze by the waterside, take in the sight of waves or the calm water, and set your eyes to the beautiful sunrise and sunset. Some beaches and parks on Long Island also feature boardwalks set within a nature trail, so you get to enjoy nature at its finest – with wetlands vegetation, trees, birds, fish, and more. 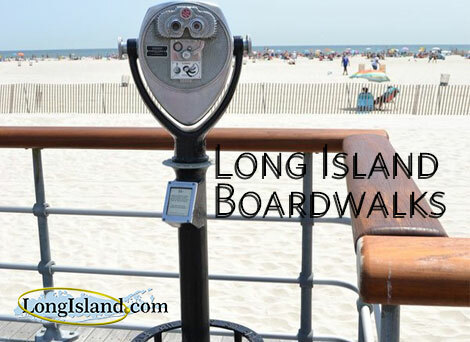 From Nassau County to Suffolk County, residents and visitors have plenty of options for boardwalks to head to! Making up the central and eastern part of Long Island that is surrounded by water on three sides, many of the boardwalks offer a view of either the Atlantic Ocean, Long Island Sound, the Peconic Bay or the Great South Bay. A Town of Islip Recreation Card is required to enter the Bay Shore Marina and for access to mainland beach parking. Enjoy a stroll along the boardwalk that sits next to Benjamin’s Beach. This regional park is used all season long. It’s a popular destination for Town of Islip residents. Parking is Free with the Empire Passport, or $8-10 for cars during Peak Hours April through November. This park is a fishing and crabbing haven. Take a stroll down the boardwalk to see what catches have been made and enjoy the beautiful view of Fire Island and the Fire Island Lighthouse at The Overlook. Enjoy a nice walk along the boardwalk at this waterfront park! It’s also in the area of where the traditional annual festival of Cow Harbor Day is celebrated. Seasonal Beach Parking Permit available to residents. Non-resident parking fees apply. This public beach features a boardwalk complete with dining options for the hungry beachgoer. And who wouldn’t be after a fun time on the boardwalk and swimming, fishing, canoeing and kayaking at the park. Part of Fire Island are accessible all year. Driving to either end of Fire Island National Seashore is possible, but you cannot drive from one end to another. There are no entrance fees but expect to pay parking and/or transportation fees in order to get to most parts of Fire Island. Walk along the restored boardwalk path that leads to the Fire Island Lighthouse (bikes are not permitted on the boardwalk). The area took a beating after Hurricane Sandy in 2012, but restoration was completed and the public can enjoy the natural beauty this place has to offer once again. Start out at Robert Moses Parking Field 5 and take a three-quarter mile boardwalk walk from there to the Fire Island Lighthouse. Enjoy a nature trail boardwalk over head-waters of the Connetquot River. You’ll get views of wetland vegetation, waterfowl and fish. The park is a fully accessible facility designed for the disabled and their families. Parking with Southold Town permit only. Purchase resident or non-resident parking permits at the Town Clerk’s Office. Beach attendants on staff on Fridays, Saturdays, and Sundays and may only issue daily parking permits. Unlike other beaches with a boardwalk that stretches for what appears to be miles long, this one is smaller. There’s also a fishing pier. Beach Pass required to enter or stay on the beach between hours of 9 a.m. – 6 p.m. Parking is free. This 2.2 mile boardwalk offers a breathtaking view of the ocean whether you’re looking to taking a stroll or work up a sweat biking or rollerblading (permitted on the boardwalk). This amazing family beach offers kayaking, canoeing and bicycle rentals, on top of a boardwalk facility perfect for a lovely family walk! This beach park offers a short half mile boardwalk at Field 5. A longer boardwalk is also available that takes you through the dunes that leads to the Fire Island Lighthouse. This family-friendly park features a ¾ mile boardwalk where you can take in the stunning views and calm waters of the Long Island Sound while catching a view of Connecticut in the distance. Making up the western half of Long Island, many coming to enjoy the boardwalks will appreciate the relaxing sea breeze from the Atlantic Ocean. For a view of the Great South Bay, you’ll enjoy this boardwalk that essentially wraps around the perimeter of the park. The boardwalk is open year-round. Whether you want to go for a walk or get into cycling, this shorefront location makes a great place for it. This world famous summer destination brings in 6-8 million visitors each year. Be a part of it, stepping foot on its long boardwalk complete with food, shopping, entertainment and space for the walker, jogger and much more! The Long Beach boardwalk was totally rebuilt and reopened in 2013 after it was hit by Hurricane Sandy. Now back up and better than ever, the 2.2-mile long boardwalk can be enjoyed for biking, running or simply walking. The rebuild includes the use of sustainable hardwoods and concretes and it still holds some originality with its old time benches, light poles and the retaining wall. Don't see your favorite boardwalk listed? Let us know!